Recently a friend mentioned she likes to have her writing edited as she works, that having a second set of eyes during the process is like flipping a light and illuminating the piece for her. I had this mental image of her sitting with her words, illuminated, just glowing as she wrote. I told her my process and figured it was worth dipping into a bit more, here. It used to be that if I shared a work in progress before the first draft was done, the piece died and I never finished it. But as those of you who have followed this blog for some time know, radiation kind of fried my writing process and the past two years has been spent discovering the new ways I can write. Over the past couple months, I shared my work in progress with my friend Jenni, who shows up here in the comment section, and with two published authors during a writing retreat. I shared by giving them pages to read. I did so with trepidation knowing my history, but it was fine. The story survived. I got overly enthusiastic and read a problem passage to Jenni. At the time it felt okay, but then that old familiar heavy feeling started, and sure enough I didn’t write. Saturday I forced myself to go back to the piece, wrote very stilted for a bit, and then very slowly found my way back to the flow of words. Kind of like writing CPR. This is what I picture. Rather than being in that golden glow like my other friend, I’m more like this weird creature hiding in a dark room, caught up in an imaginary world. I can share the story only once I am done with it. If I share it too soon, it’s like the door opens and lets in too much light, glaring spotlight-like, and me and my words shrivel. Kind of like a slug with salt poured over it. No, I am not going to make vampire analogies! So, letting Jenni read on her own, away from me, was me slipping the paper under the door, so to speak. I was still hidden away with my story. Me reading out loud to her was cracking that door open just enough to let some light in. Luckily not enough to kill the story. But poor Jenni isn’t going to get read to until the story is done. It brings to mind photos pre-digital, when you could over expose them and everything would be washed out. The writing process is just so weird. And so individualized. And so tentative. And so lovely when it works. I tried to find a photo of light, that would show how I pictured my friend illuminated. 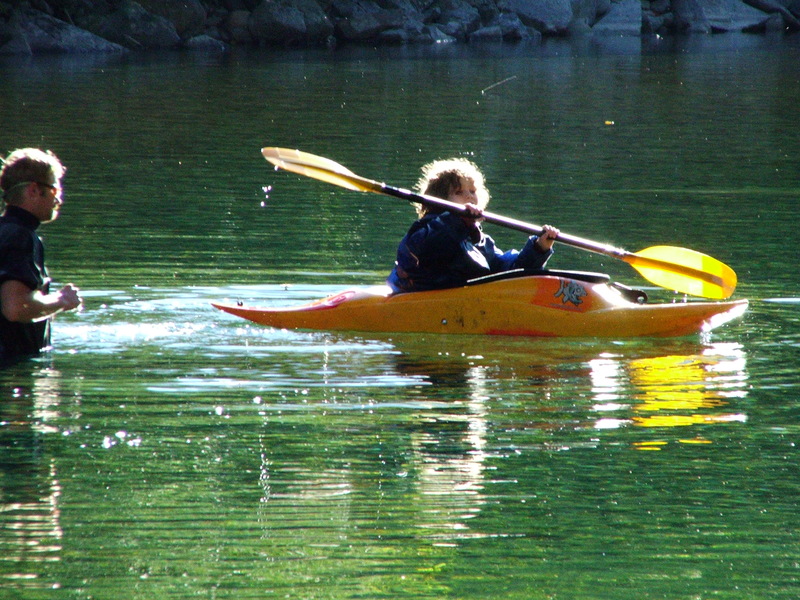 The closest I can find is one of my son, taken a few years ago during his first kayak lesson on the Skykomish river. The sun was slanted low, and he’s ringed with a glow. So no more talking about your story!!! But I will keep bugging you to finish it!!! Deal. You can nag me to write. “The writing process is just so weird. And so individualized. And so tentative. And so lovely when it works.” That says it all, Lisa. I love that mental image you got of the words glowing as they’re being written. The only times I don’t want to share my work is when I know what’s wrong with it. Then it feels like I’m running around naked and I just want to be alone while I try to fix it. I love that halo of light in your son’s hair. And that shade of green in the water is breathtaking. I’m a sucker for that color. That shade of green is the summer color of the river, and in that photo the river was low so it appears calm, even though there’s still a current. In the spring the color is more of a gray-green from all the snow-melt. And of course, while the photo makes it look calm like I said, it really is a rushing whitewater river as you can see in photos in the ‘about’ section here. You should see it roaring during a flood, bearing whole trees, root balls and all, tossing those huge evergreens up on the bank and into houses. You can stand in the town hall where I work and feel the rumble of boulders moving. It’s terrifying and amazing. Oh, I’ve had that ‘running around naked’ feeling a time or two!